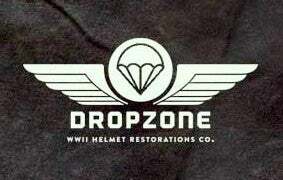 Dropzone Helmet Restorations Co. — Replica WWI German M-1916 Helmet & Liner. Camouflage Pattern. Replica WWI German M-1916 Helmet & Liner. Camouflage Pattern. This is a Replica WWI Model 1916 German Camouflage Helmet. Made of solid steel, leather liner & leather chinstrap with brass hardware. Liner is roughly a size US 7. Makes a great display piece for your collections. PAYMENTS: I accept PAYPAL, Money orders & Checks. Shipping in the USA is $14.95 and Actual Airmail for Overseas, No hidden fee's, I ALWAYS combine shipping, please ask for quotes. Any and all questions, Please ask before the auction ends. Shipping to Canada USPS is around $48.00.